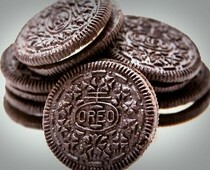 March 6th, 2012 is the 100th birthday of Oreo cookies. All kinds of celebrations are being planned. Such excitement over a little cookie that’s been around even longer than me! If I take a trip down memory lane (thanks again Mother for that wonderful expression), I remember my husband taking the filling out of seven cookies and building what our 4 children believed to be the world’s largest oreo. Just the other day, my hip hop artist daughter, Heidi D, brought up that childhood memory. She was laughing hysterically on the phone just thinking about the memory of her Father stuffing the biggest cookie on this planet in his mouth. So this brings me to the REAL reason I am writing about Oreo cookies. Life is filled with moments like this that make us happy just thinking about them. I smile every time I eat an Oreo. And yes, I still take my cookie apart and peel off the creamy inside and pop in my mouth. I like the memories it evokes. And most importantly, it reminds me that life holds little bits of sweetness that make it all worthwhile.